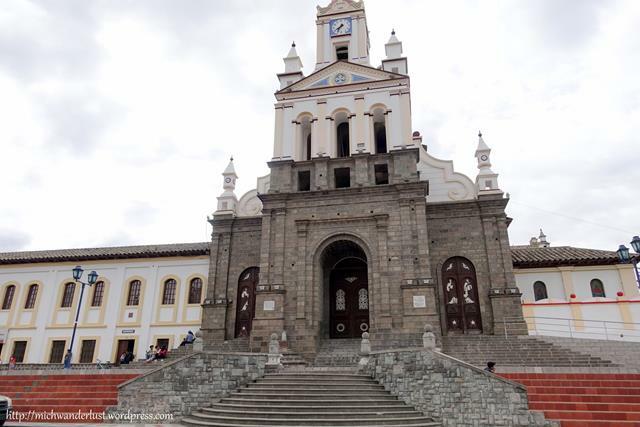 Otavalo is worth much more than a day trip from Quito. 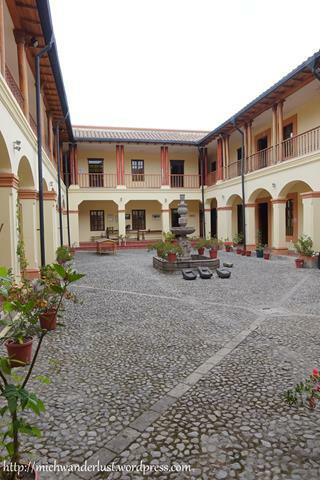 There are a number of day trips from Otavalo itself that are worth making! 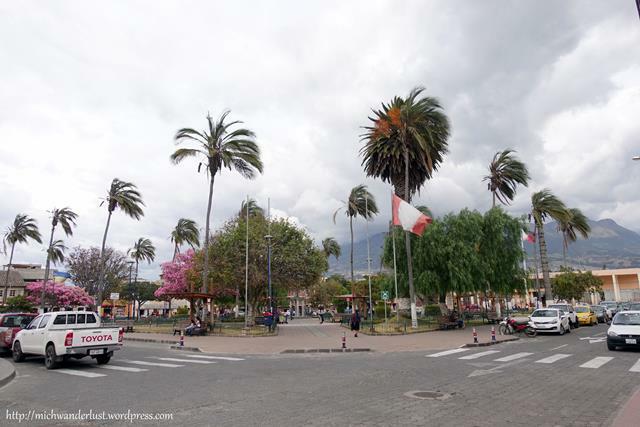 As part of my cultural excursions with Mundo Andino Spanish School in the afternoons, I visited the community of Peguche and the city of Cotacachi via bus. Each trip took less than 3 hours. 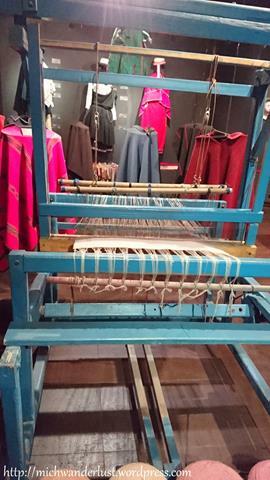 Other day trips from Otavalo include a visit to a traditional backstrap weaving workshop, the totora-weaving community of San Rafael, the Lagunas de Mojanda, Laguna de Cuicocha, and Laguna de Yahuarcocha in Ibarra. 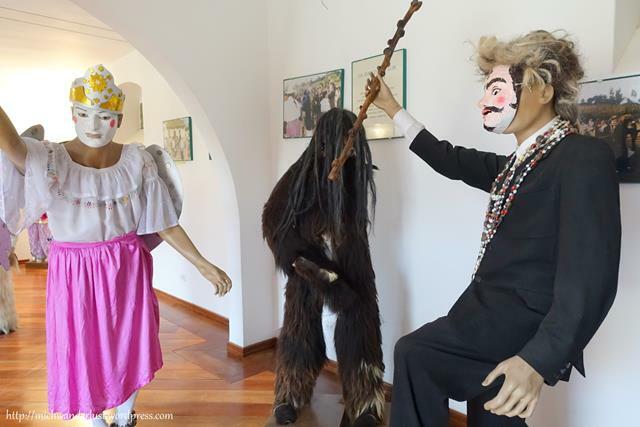 There’s no shortage of things to do in Otavalo. 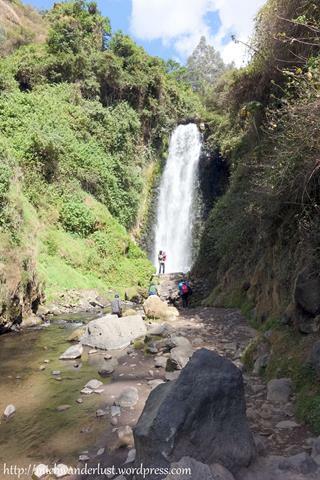 The Peguche waterfall is one of the most popular day trips from Otavalo. It’s only about a 10-minute bus ride from Otavalo (which currently costs $0.30), and there were only a few other tourists there on a Monday. They said that there are a lot more on Saturdays. Admission is free (although donations are encouraged), and the waterfall is at the end of a very pleasant 5-10 min stroll through this park. 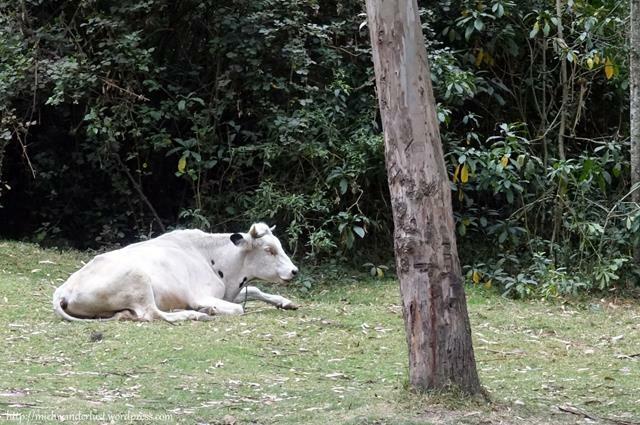 I was really amused by this random cow lying in the middle of a field used by campers and picnickers. My teacher/guide, however, was completely unimpressed. Tell-tale sign of a big city girl! It’s also the dry season right now, so the waterfall isn’t as big as it would be otherwise. It’s still lovely, though. The indigenous community who live here have a waterfall-bathing ritual in the middle of the night during Inti Raymi, the festival of the sun in June. It’s in order to wash away negative energy (or something like that). The water is pretty cold here. It doesn’t sound very pleasant! My teacher-guide also explained that during the festival of Carnaval, a lot of youngsters use the water from this waterfall to throw water bombs at each other. It sounds a lot like Songkran in Thailand! 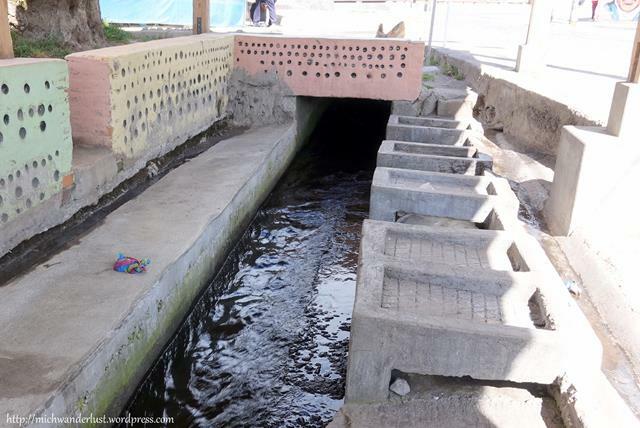 The water isn’t particularly clean though, as many people wash their clothes in it. There are even special rocks for laundry purposes! After visiting the waterfall, we took a stroll through the community of Peguche. It was quiet, but again, it apparently gets a lot more lively on Saturdays and during festivals like Carnaval. 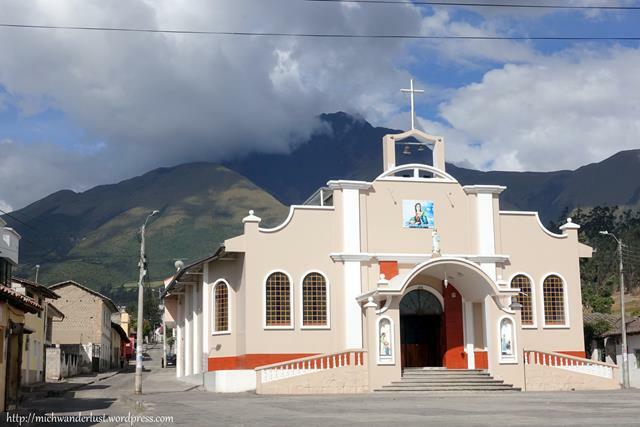 You can see the mighty Imbabura volcano (4,630m/15,000ft above sea level) behind the church. Here you can find really traditional family businesses. 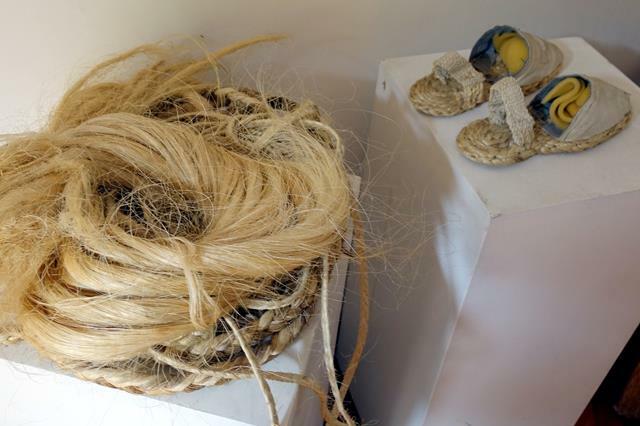 You can see the weaving looms in the workshop, as well as the wool and the (all-natural) dyes they use. 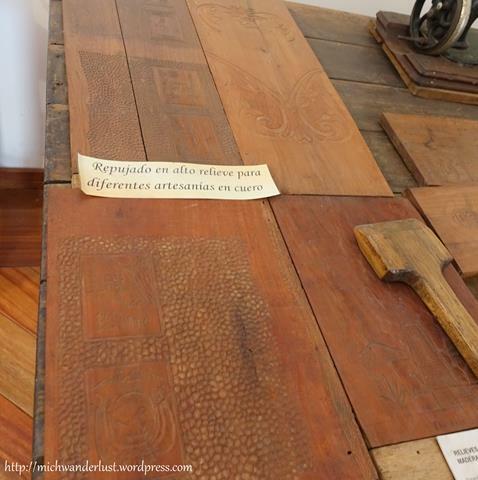 I asked my teacher-guide whether you can find similar stuff in the Saturday market. According to her, you can, but those are made of synthetic materials. We also popped into another family-run shop selling traditional musical instruments from all over South America. 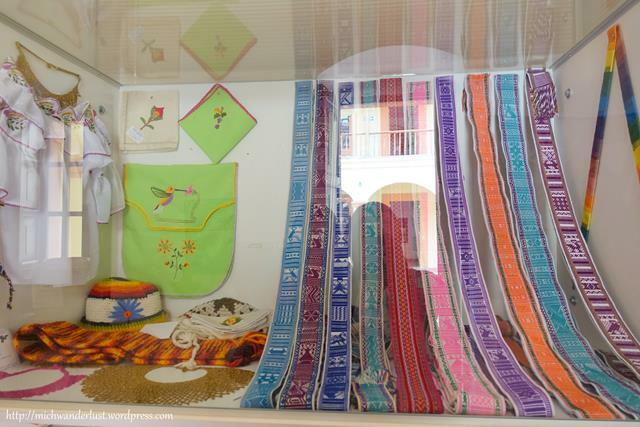 I saw a number of instruments from Bolivia and Peru as well as a few Ecuadorean ones. There’s a very cool Afro-ecuadorean instrument which sounds exactly like rain! The shop also has a number of more souvenir-type things like keychains. So, now you know. 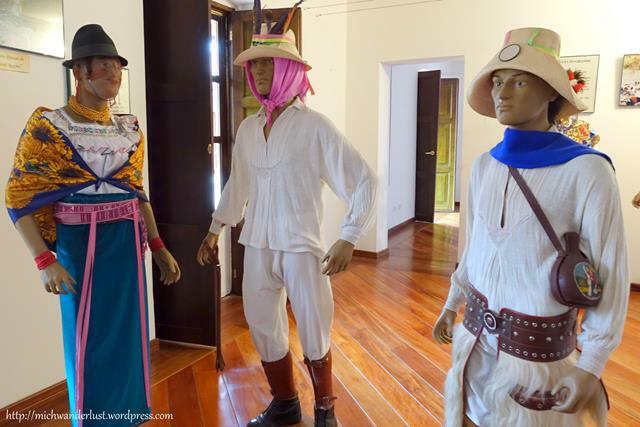 There’s so much more to Peguche than the waterfall! 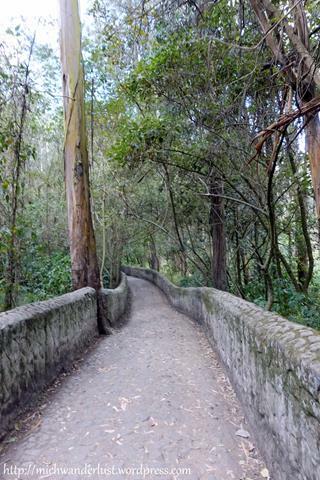 If you go, take some time to wander around the community after visiting the waterfall. 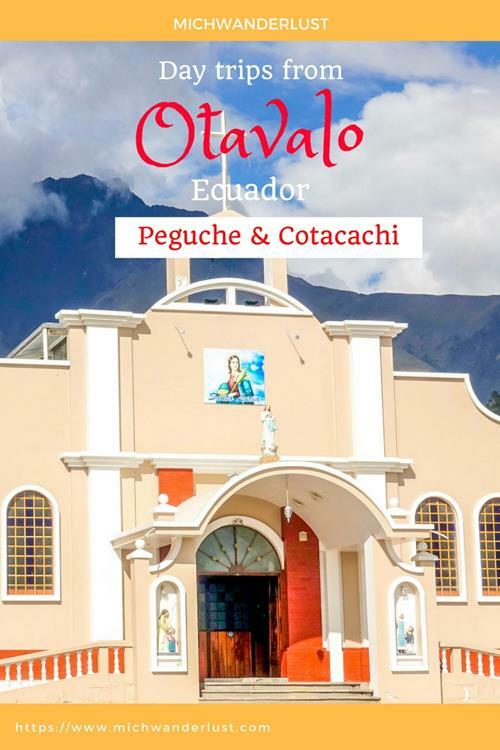 Cotacachi is another great day trip from Otavalo. This city is about a 20-min bus ride from Otavalo (which currently costs $0.35), and is famous for its leather goods. Walk down the main street (which we did) and you’ll see shop after shop selling leather bags, jackets, shoes, etc. Confession: that actually isn’t me at all. But even as someone who isn’t terribly interested in shopping, I was charmed by this tranquil little city (even quieter than Otavalo). There’s actually a fairly large community of North American retirees living here, and I can see why! The museum is located in a building that’s over 100 years old. Like many other old buildings (as I mentioned previously), it has an open-air space in the middle to let in light. Admission is free and we even got a guided tour! It started off with this display of the different types of maize. 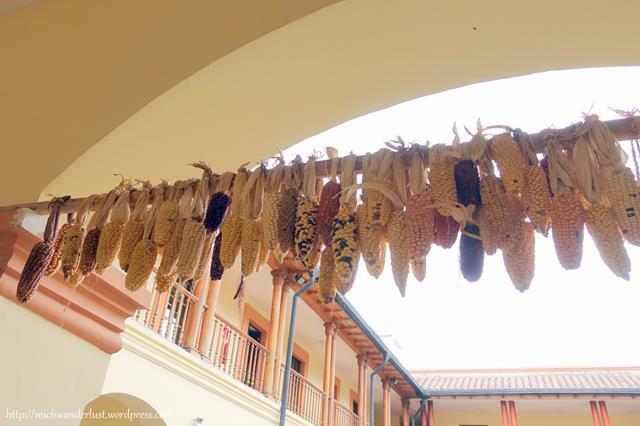 I’ve never seen so many different types of maize in my life – and they have different uses. 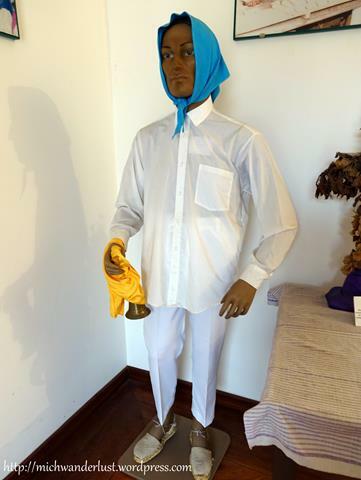 As usual, I was particularly interested in the section on traditional attire. I’d seen indigenous women wearing the colourful belts above, but I’d never realised that the colours each have a specific meaning. 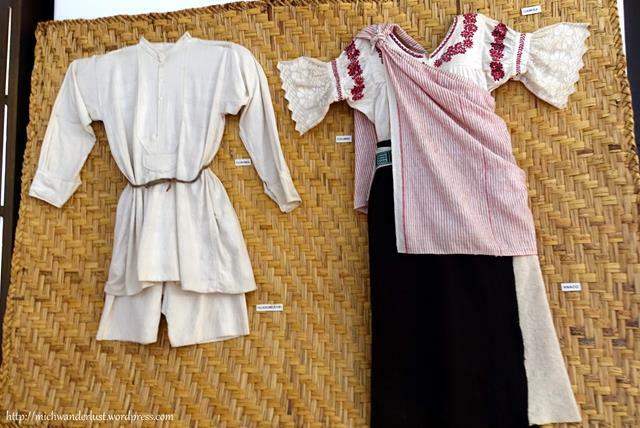 For example, the blue/purple belts are worn by pregnant women, and the pink belt is worn by young girls as it has a young and virginal connotation. 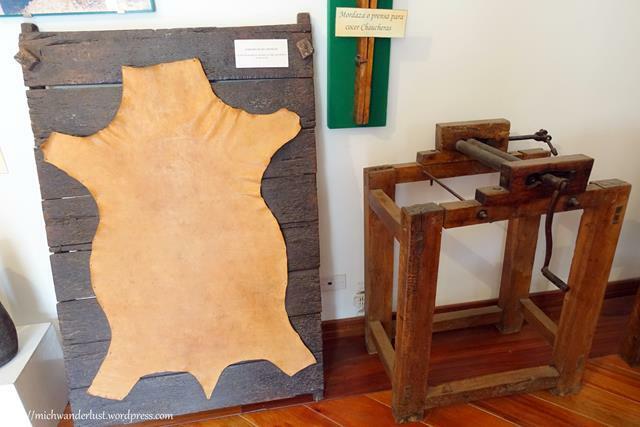 Of course, there had to be a section on the leather goods industry here. Interestingly, this industry only really picked up during World War II. This was when they started exporting directly to the US as the goods were needed for the war. The musical instruments section is also fascinating. 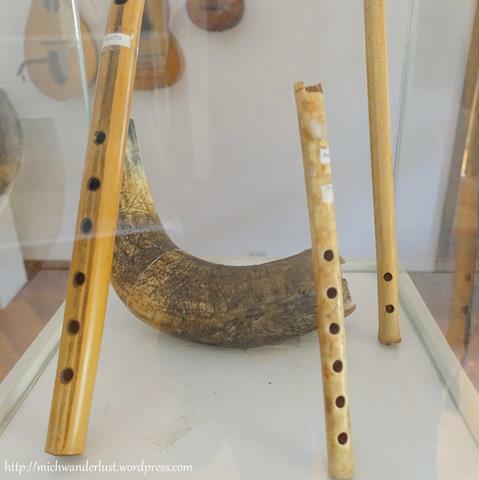 The little flute-like instrument on the right below is made from condor bone(!). It’s really rare and isn’t being made anymore, obviously. 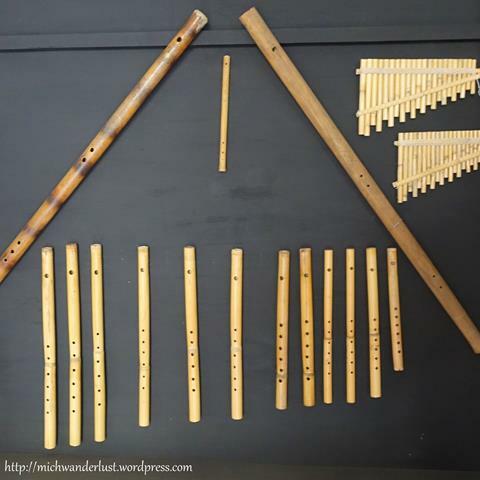 Each flute-like instrument below is used for a specific occasion. They each have 6 holes (excluding the mouthpiece), and each hole signifies two months of the year. On each flute you can see a line indicating which month the flute is intended to be used for – e.g. if it’s in May/June, that would be for the festival of Inti Raymi. The harp is not indigenous to Ecuador, but it’s been incorporated into indigenous culture and they use it at weddings. 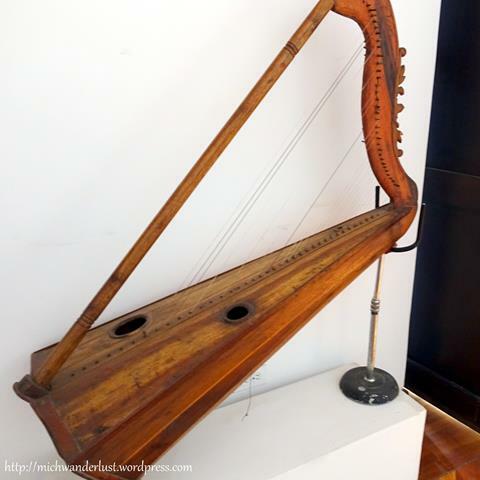 This particular harp is note-worthy because one of the strings is made from cat intestines(!). 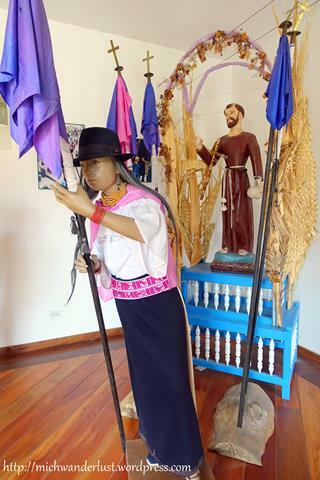 Below: a depiction of the Semana Santa (Holy Week) celebration. As you can see by the pink belt, it would be a fairly young girl doing this. There’s an interesting story behind the scene below, although I didn’t understand all of it. From what I understand, the story is that God was angry at mankind for not listening to him., and wanted to give up on them entirely. However, these two characters appeared (the woman represents an angel and the man represents the devil). And they put on a comical performance which amused and appeased God. Once their job was done, these two disappeared mysteriously. It’s said that they will only appear when there’s a need for them. Above: the Inti Raymi festival (festival of the sun), which takes place in late June. It’s a pity I can’t be here for this festival! I’ve heard so much about it and it sounds like a really big event. The Day of the Dead (as I mentioned previously) is a more joyous occasion for the indigenous people. On the Day of the Dead, the guy above goes around the cemeteries with a bell to “wake up” the dead, so that they know that their relatives have come to visit and eat with them. There is a small art exhibition as well, showcasing works by local artists. As a parting gift, we got a small brochure on things to do in the Cotacachi area, a pen and a ribbon! All useful, except for maybe the ribbon. 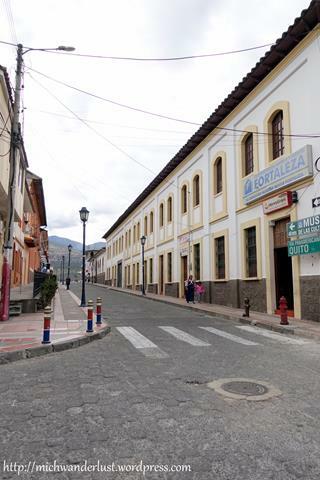 We were in Ecuador a few years ago and I remember how quaint these towns were! I didn’t do any shopping, but this looks like a great place to go for a leather jacket! Thank you for sharing and bringing back some memories!